I want to let you in on a little secret of mine. 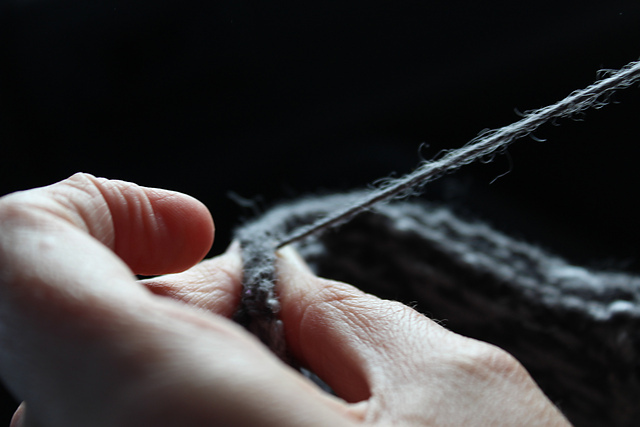 I actually like sewing in ends and sewing up garments. I find it sort of meditative. There's something so satisfying about taking separate pieces and producing a wearable garment. I often work in cars. If I'm not driving, I tend to need distraction so that I am not the world's worst back seat driver. (I hate other people driving my car but seeing as all my children are old enough to drive, I occasionally have to grit my teeth especially when playing in their neck of the woods. Apparently I drive too country to be allowed to play in the city). So this is a sunny Saturday afternoon heading for a lovely lunch in down town Mornington. I had my camera with me and the boy decided to capture my delight with my handiwork. "But what are you sewing up?" I hear you ask. 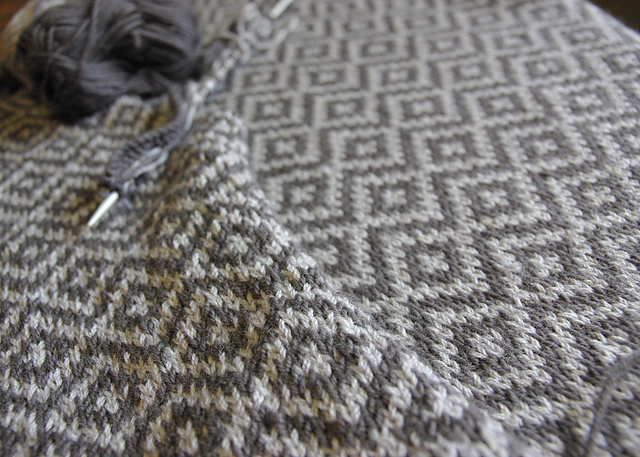 Well this is Graphic Grays, another of my stash to sweater efforts in 2015. 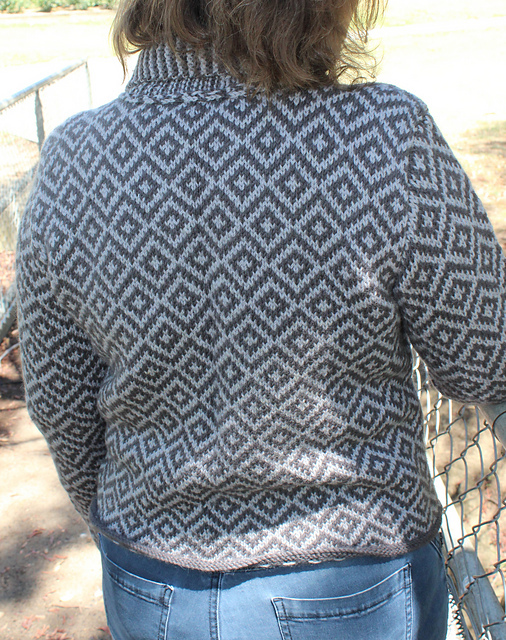 Pattern: #12 Graphic Jacket by Jacqueline van Dillen from Designer Knitting Early Winter 2013. Yarn: 8 ply Blue grey machinewash bought from op-shop (8.5 balls) and Moda Vera Pure Wool 8ply shade 44 Dark Gray (10 skeins). My daughter Melissa went on a giant trip through Europe at the end of 2013. This was part of the Christmas present she bought home for me - Italian and European knitting magazines. (Best present ever!) This pattern just sang to me - classic, elegant, a little Chanel-like and could double as a jacket / blazer. As a University lecturer, I do have a job that often calls for corporate suiting but I loathe actually wearing a conventional blazer. It feels too restrictive across my back, shoulders and upper arms. To me wearing a blazer / suit jacket is like wearing a straight jacket. I have the same sort of aversion to traditional shirts. This is a nice compromise. I have the world's largest collection of cardigans but this one will take the style formality up that little notch. Now I don't really have worsted weight yarn in the stash. 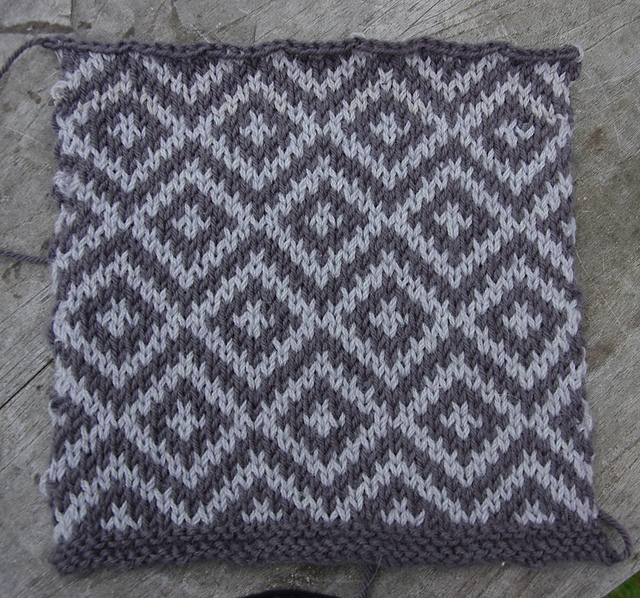 I wanted to knit this in DK (Australian 8 ply) so swatching was absolutely necessary. Strangely enough, I got gauge first time with the suggested needles (4.5 mm). Isn't it a pretty swatch? You can really see the pattern properly here. 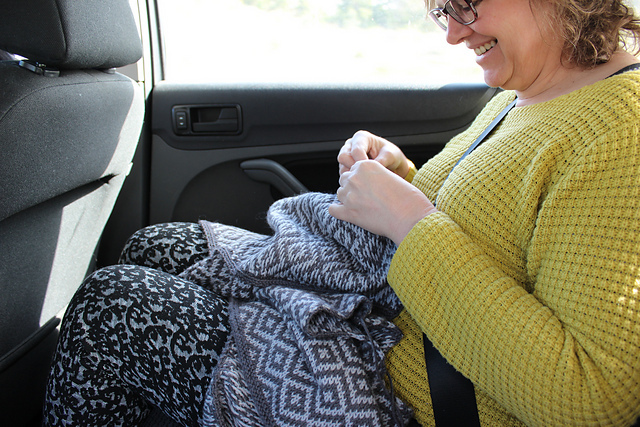 This was gorgeously addictive colour work. 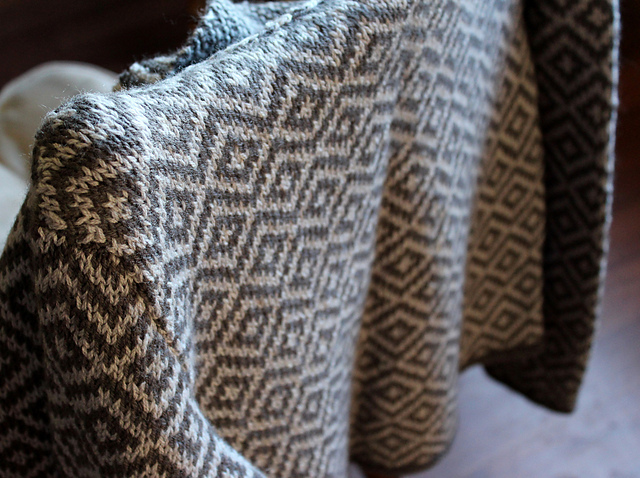 Proper traditional fairisle with only two colours per row, short colour repeats so no long floats to weave in and a easily memorised pattern. 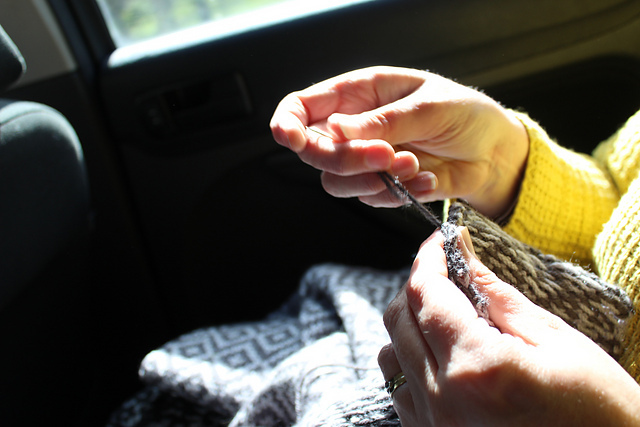 Even though this was quick to knit, it was slow to finish. 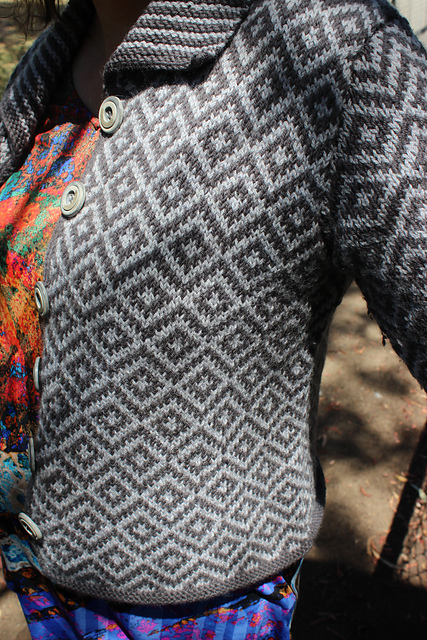 I swatched in January, cast on the sleeves in February, knitted the backs and fronts through the Aussie winter, sewed it up in August and officially finished in October (sewing on the buttons) but didn't get shots of me wearing it till a ridiculously hot day in December! Let's blame it on the buttons shall we? They were a saga in themselves. 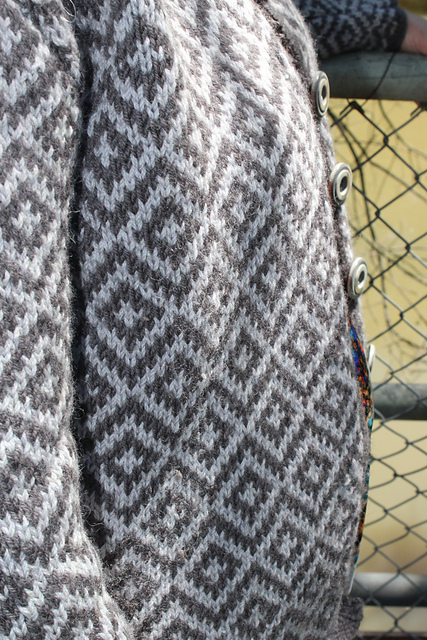 The pattern called for self cover knitted buttons. Our local haberdashery has moved to a town a half an hour away so things like this require a planned shopping trip. I couldn't get the size of self cover button I wanted and so compromised on the next size up. Then I got them home and tried to assemble the first button and they were defective. They were missing the little gripped / spiked edge to hold the fabric and the fronts and backs didn't clip together and hold. So it took me a month to make the trip to return them and I couldn't get any self cover buttons that time. (They had been recalled because they were defective - strange that?). So I left with a refund but no buttons. Finally about 6 weeks later, I had to get a poster printed for an academic conference and had an hour to kill and finally bought some appropriate buttons. It was late September by this time). I did sew the buttons on as soon as I got back from the conference though! I'd actually worn the jacket without buttons a few times. I'm now looking forward to getting a lot of chances to wear this next winter. This is the photo that made me realise I really needed a haircut as it's all flyaway again.